I am sorry to say that I did not have a wonderful time at the Tea, Brie and Skeleton Key charity event at The Parlour. It should have been wonderful. The Parlour, Old Town's new tea room, is elegant and the food is delicious. The scones are flaky, the little strawberry cakes sweet and fruity, and the lemon tarts are perfect. But the afternoon was spoiled for me when I spotted Alex German, my current beau, present with another woman. It's not as though we have an understanding of exclusivity in our relationship, but seeing him there with a beautiful and attentive woman came as a surprise. I'd like to think she might be his sister or cousin, but I wasn't the only one who thought she wasn't treating him like a relative, if you catch my meaning. Sigh. I would have run straight to the police if I had received a threat like that. But it was sitting on his desk with some other very strange little poems. Doesn't that sound like a death threat to you? And now he's dead . 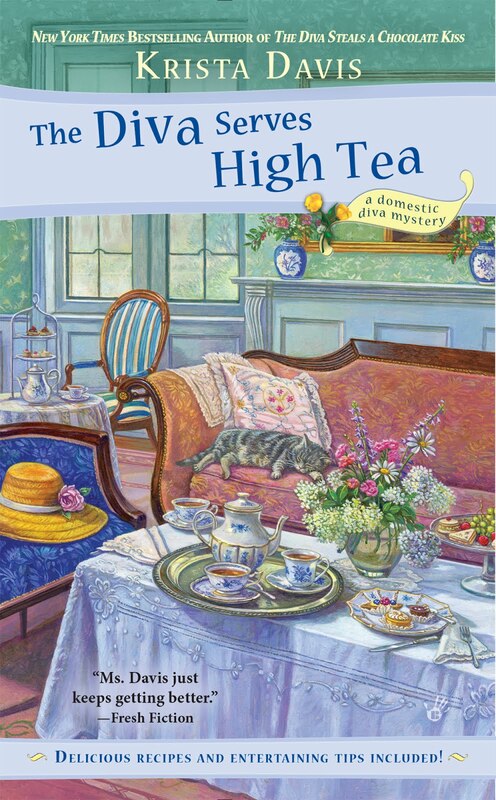 . .
Krista is giving away a copy of THE DIVA SERVES HIGH TEA today. Leave a comment with your email address, please, so she can contact you if you win. Good Luck! I have not read one yet. I would love to. Finding a body would put a damper on things. I would love to win this newest Diva book! Looking forward to reading soon! I am intrigued by Tea, Brie and Skeleton Key! Sounds great. Thanks for the giveaway. What a scary poem!! Thanks for the contest. dammad58@comcast.net It looks like a great read. Tea lovers unite! I'd love to win a copy. Kh38668 at yahoo dot com. Please. Thanks for the chance to win! As always, looks like a great read! Congratulations, Amanda! You are our winner! I just started this series! Love it. Thank you for this opportunity! I would really love to win a copy. This is do exciting! OK. A questionable beau's commitment and murder? What a bit of drama! I love the series, and can't wait to enjoy the newest adventure. I have not read this series .... yet... but Sophie's note makes me want to jump in. mlarkin at rmrgroup dot com. I love this series. I can't wait to read this one! This is a great series, I can't wait to read "The Diva Serves High Tea". Thanks for the great giveaway. Notes like that would probably send me to the authorities. Great post, thanks for the chance to win! Great mysteries and I love them! That would definitely scare me, seeing a poem like that! Death threat by poem? Very creepy. Thank you for the chance to win the latest in this great series. That is a frightening little note. What a great series. Thanks for the chance at winning the new one. Can't wait to read this. Thanks for the chance! This book sounds great! Thank you for the chance. Ah well, would have loved to win a copy of this very intriguing book, but the email didn't come into my box until 11:40 last night so I didn't see it until today, June 21st. Will just have to put it on my list of want to reads. Wow sounds like a good book. Love the Paws and Claws series! I just know I'll love this one too!